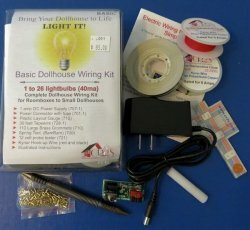 There are three electrical wiring kits designed to provide one with everything they will need to successfully electrify their dollhouse. The kits come in three sizes based on the size of your project. 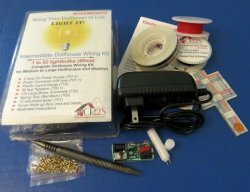 The Basic Dollhouse wiring kit has all that you need to light roomboxes to small dollhouses with one to twenty-six 40ma. incandescent light bulbs. The Large kit is designed for Medium to Large dollhouses and is capable of handling one to fourty-two 40ma. incandescent light bulbs. 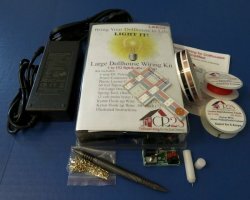 The Extra-Large complete dollhouse wiring kit is for that Large to Extra Large dollhouse and will handle one to one hundred fifty five 40ma. incandescent light bulbs.